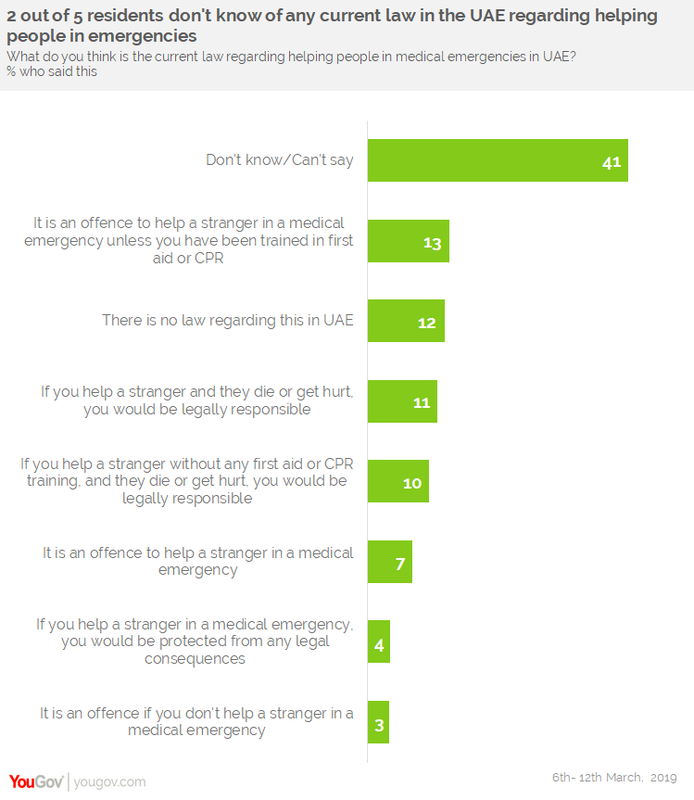 on April 1, 2019, 10:14 a.m.
More than three quarters (78%) of people in the UAE are willing to help people caught in medical emergencies once the Good Samaritan Law is enforced in the country, new research from YouGov reveals. The UAE is soon set to become the first Arab country to pass a ‘Good Samaritan Law’, which allows bystanders to offer aid in medical emergencies without fear of legal consequences. The data also shows that more than four in five people (86%) would voluntarily undergo medical training after the law comes into effect in order to become better equipped to offer assistance in an emergency situation. YouGov’s research finds that at present just under a quarter (24%) said they are trained in giving CPR and a third (33%) are skilled in performing basic first aid treatments. However, more are keen to develop their skills in these areas once the law is introduced. One in six (17%) are willing to pay to get themselves trained in first aid or CPR, with men being twice as likely to pay for training than women (21% vs 10%). Furthermore, more than a third (36%) would like to take free training and one in three (33%) would do it if it is both free and convenient for them. 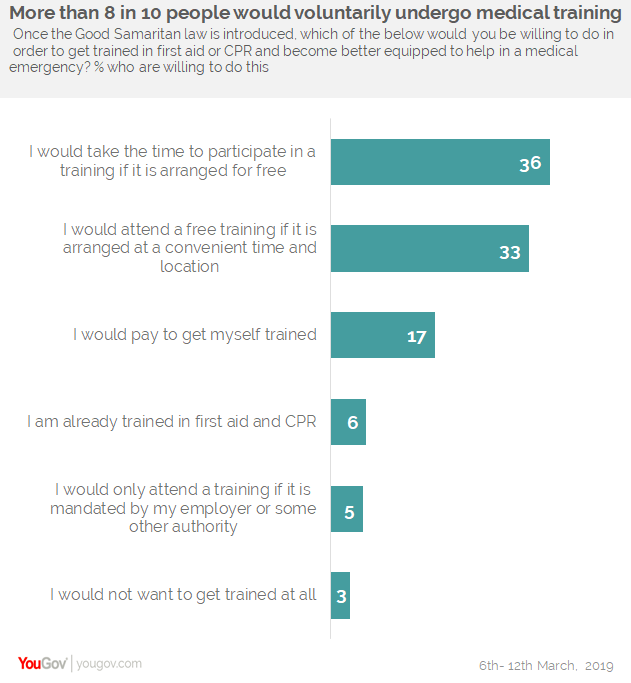 One in twenty (5%) are willing to get trained if it is mandated by their employer while only 3% said they would not want to learn CPR or first aid at all. The research shows that 6% say they are already trained. YouGov’s research reveals that many people in the UAE do not have much knowledge of the current law about helping people in emergencies. Just under a quarter (23%) think it is an offence to either help a stranger in a medical emergency (7%), to not help a stranger in a medical emergency (3%) or to help a victim without being trained in first aid or CPR (13%). One in five (21%) believe they would be legally responsible if either they tried to help an emergency victim and that person gets hurt or dies subsequently (11%) or if they help a victim without first aid or CPR training and they get hurt or die later (10%). The research says that 4% think otherwise and feel if they help a person in a fatal situation, they would be legally protected. While one in eight (12%) believe there is no existing law in the country regarding this, four in ten (41%) do not know about any laws related to this. The research suggests that the proposed new law is not well-known. Under a quarter (23%) are aware of it being introduced in the UAE, one in five (19%) are not sure if they have heard about the law while approaching three in five (58%) don’t know about it at all. Data collected online by YouGov Omnibus among 1,011 respondents in the UAE between 6th and 12th March 2019 using YouGov’s panel of over 6 million people worldwide. Data is representative of the adult online population in the country.